I have an unhealthy relationship with numbers. We don’t get along. We are not friends. Yet we are FORCED to see each other every day. I have to pay bills, which requires subtracting all the money we have until we have a small number. I then take that number and try to make it equal the amount of money we want to spend on things. It NEVER adds up correctly. Stupid numbers. Before cell phones I hated making phone calls. I’d say, “Where is that piece of paper with that person’s number on it” as I ran around like a crazy person scrounging through all the stacks around the house. Now I simply push on the word “Mom.” Ha, numbers. I don’t need you now! I can still recall the dreaded Timed Times Table Torture in fourth grade. I don’t care if I have the slowest time in the world because I hate you numbers. HATE YOU! I had straight-As until you came along. My anger and hatred of numbers was fierce. I would cry and scream at the site of my math homework. I’m sure my mom loved that (sorry mom). Then when I was in junior high school I took a math class over the summer at the junior college. The instructor had THE MOST amazing blue eyes and I would stare into them and lose myself. Mr. Bell…whatever happened to you and those eyes… (I guess that’s not really a number story, but a happy memory that happens to sort of be related to numbers). So my anger at numbers eventually evolved into an outright disregard. In fact, my husband coined a nickname for it when we were in high school together. BridgEnomics. We were walking down the trail and we saw 10 million bugs cross the path. I’ve been married to my husband for 100 years. My kids wake up and pull out all 2,000 stuffed animals into the hallway (that number might not be far off, actually). Some might just call it exaggeration. However, I think it’s an utter and complete rejection of actual numbers and figures. I don’t even do it on purpose. It just happens. 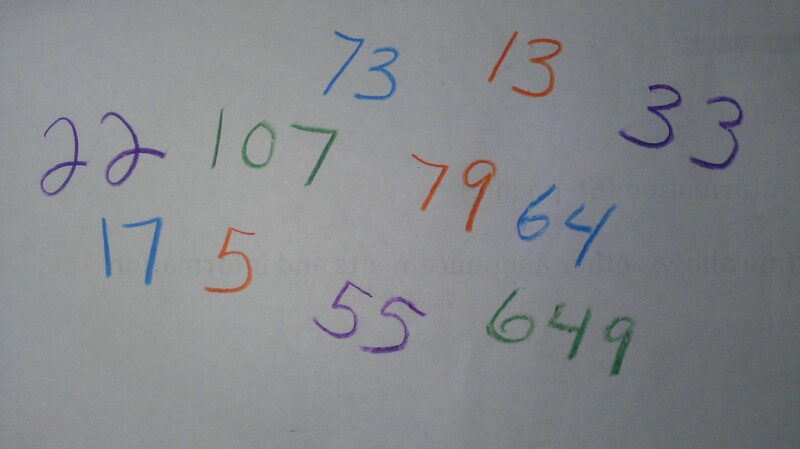 Maybe the part of your brain that remembers numbers got damaged from the 6 billion times I fell off my horse as a kid. Or maybe it’s the 50 cups of coffee I drink each day. In any case, consider this your warning. You will probably never get an accurate figure from me. Do not ask me how many miles I drive each day (50? ), or how many cups of flour are in my bread recipe (12?). You’ve been warned. This entry was tagged Budgeting, Math, Numbers. Bookmark the permalink. Love it… I too hate numbers. all numbers from age to bill to weight… hate them!!!!! I work in Finance. And deal with lots of numbers every. single. day. But when I get home? I’m an absolute idiot at math. Cooking, baking, bills, helping children with homework? Not a chance. Because IDIOT. I actually am quite sure that I have dyscalculia. http://en.wikipedia.org/wiki/Dyscalculia I can tell you that exchange rates used to send me into a tailspin. 🙂 I’ve learned to simply embrace it and my husband knows to keep an eye on me. I sometimes even say numbers that I’m not thinking. It’s 8:05 and I’ll tell someone it’s 5:05 but I see the right number in my head. I guess it’s my Achilles’ heel.